(VIDEO) The Transition Academy, located in the Burkhart Center for Autism Education and Research, teaches valuable life skills to young adults with autism. The halls at Raider Ranch, a Lubbock retirement community, were filled with the sounds of recognizable carols less than two weeks before Christmas. The music was provided by more than a dozen students with autism who are enrolled in the Burkhart Center's Transition Academy. 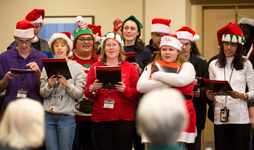 After their performance, the students delivered nearly 100 handmade ornaments to the facility's residents.